In case you’re scratching your head, going ‘Do I what?’ let me tell you a little bit about it. All you need is this doohickey, namely a disc -round or square- with slots. Here’s the round one…. 1. Pick the material you’d like to use. That can be yarn, floss, ribbon, twine, suede cord – it all depends on what you want to use your braid for, what look you wanna achieve. 4. Use all 8 strands to form an overhand knot about 1″ from the end. 5. Push it through the hole in the middle of the disc. 7. 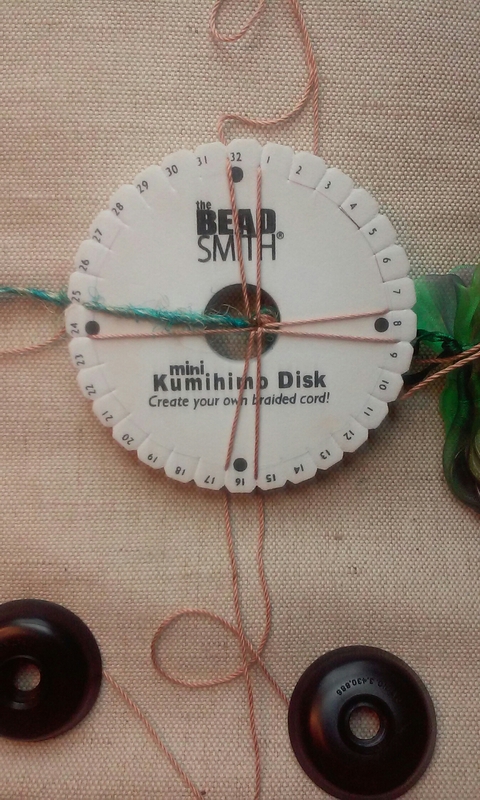 Now wrap each strand around the plastic bobbins you got with your disc. Fold the cover over, and the threads are secure, yet easily manageable. 8. Now thread your strands into the slots… 1 each to the left and right of the black dot. 9. You can actually start braiding now! Take the thread from the left of the top dot straight down, and secure it next to the thread on the left of the dot on the bottom. Now take the thread from the bottom right straight up. Turn the disc clockwise, and repeat. 10. Round and round you go, and pretty quickly you can see the result of your labor. When you reach your desired length, use all 8 strands to form an overhand knot, and you’re done. One more thing…somewhat related. Last Sunday I held the very first ‘Creative Chicks Meeting’ at my store. My friend Dee had a lot of fun learning about Kumihimo, and tried her hands at it..
Now you know to take the thread on the right up, turn and keep going!